THURSDAY, 18 SEPT – Universiti Malaysia Sabah (UMS) Centre for Postgraduate Studies (CPS) is now opening their application for Master and Doctor of Philosophy studies semester 2, 2014/2015 academic session. According to the statement by CPS, the closing dateline for the application is on the 30th November 2014. The application can be submitted online through http://smpp.ums.edu.my/application. 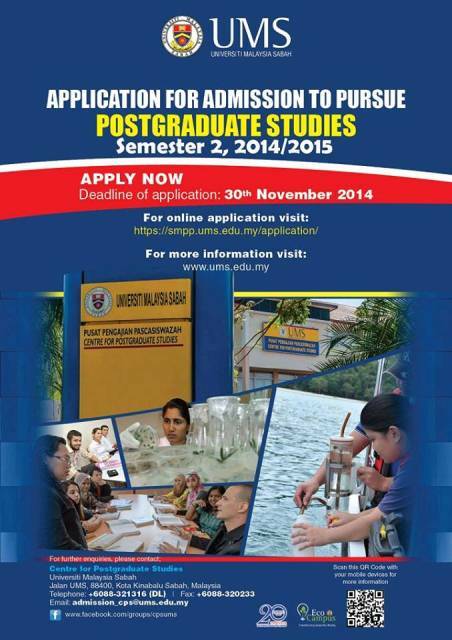 For more information on the postgraduate programmes, please call CPS line 088-321316 or email admission_cps@ums.edu.my.